For recent episodes of The Bike Show…. The Bike Show is going strong, but this feed on the Resonance FM podcasts page has not been updated since June 2009. This entry was posted in The Bike Show on March 6, 2011 by Jack Thurston. The Bike Show emerges from its late spring hibernation into the bright sunlight of the summer season. This week’s show features a ride south from the Resonance FM studio to the southern limit of the station’s 5km FM broadcast signal at the Herne Hill Velodrome. With guests James Wilson, lecturer in radio at Glasgow Metropolitan College and Ed Baxter, programming director of Resonance FM. Play on links below. Other file formats (e.g. Ogg Vorbis). This entry was posted in The Bike Show on June 2, 2009 by Jack Thurston. After five years, it’s the end of the road for The Bike Show. Find out why in this special final edition featuring many Bike Show favourites including Buffalo Bill, editor of Moving Target, cycle sport correspondent William Greswell, London bike messenger Nhatt Attack, Barry Mason of Southwark Cyclists, and Joe and Wes from the London Bicycle Repair Company. This entry was posted in The Bike Show on April 1, 2009 by Jack Thurston. In the last of the current season we drop in on a police bicycle auction to pick up a bargain. Plus a bike pop epic from the Grave Architects (pictured above) and we hear from Jo Upton, presenter of Bike Love, a bicycling radio show in Sydney, Australia. This entry was posted in Uncategorized on March 26, 2009 by Jack Thurston. The Rás Tailteann is an 8 day stage race in the Republic of Ireland held each May since 1953. A particularly gruelling race, some say it is Ireland’s ‘Tour de France’ and it is a much cherished tradition, far more so than the Tour of Ireland. John Herety, Directeur Sportif of the Rapha-Condor road racing team and formerly DS of Recycling.co.uk talks about the modern Rás. We also tell the story of possibly the greatest legend of the Rás: ‘Iron Man’ Mick Murphy, the blood-drinking, fire-eating hard man who won the 1958 race in quite extraordinary circumstances. Peter Woods is a documentary-maker at RTÉ and tracked down Murphy (pictured above, at his home-made stone gym) and tells the story of one of sport’s living legends. Woods’s 40 minute documentary is compulsory listening. You can find it on the RTÉ website. Photo credit: Kieran Murray. This entry was posted in Shows, The Bike Show on March 18, 2009 by Jack Thurston. The Ride Journal was launched last year to widespread acclaim. Issue two is at the printers. Philip and Andrew Diprose, editor and art director, explain how they came to start a journal of personal stories about how bikes have changed people’s lives. Among the articles in Issue 2 of The Ride Journal is Rediscovered by Rona Sutherland and is read by Ruby Wright. Ruby presents a fortnightly music podcast on Radio Nowhere called Ruby’s Chicky Boil-Ups. It’s great! We also spotlight the new issue of Rouleur, the quarterly magazine from the Rapha stable, including an extract from Jean Bobet’s Tomorrow We Ride, translated by Adam Berry and read by Jean-Marie Orhan. To win a copy of issue 12 of Rouleur, send the correct answer to the question by email to bikeshow@resonancefm.com. Play on links below. Other file formats (e.g. Ogg Vorbis) coming soon. This entry was posted in The Bike Show on March 6, 2009 by Jack Thurston. Bicycle polo. It’s the latest sensation that’s sweeping the nation. After an account of bicycle polo played with Hungarian counts in 1934 from Patrick Leigh Fermour’s classic Between the Woods and the Water, we travel to De Beauvoir Town to find out how the game is being played in 2009. The European Hard Court Bicycle Polo Championships will be held in London this August. For more on where to play, there are lots of listings here. This entry was posted in The Bike Show on February 23, 2009 by Jack Thurston. With the UK mired deep in recession, unemployment on the rise, the value of the pound going down and consumer confidence at an all time low, we ask what effect this is having on the cycling business. We hear from the owners of two of London’s new breed of bicycle boutiques (Tour de Ville and Bobbin Bicycles), from bike messenger Nhatt Attack, who has swapped her bike for a Christiania tricycle and is delivering flowers, from Carlton Reid, cycling journalist and Executive Editor of bike industry magazine BikeBiz.com and from BikeSnobNYC who adds his two pennies from New York. Play on links below, other file formats (eg. Ogg Vorbis) coming soon. This entry was posted in The Bike Show on February 16, 2009 by Jack Thurston. This week’s show features Dave Brailsford, Performance Director of British Cycling, explaining how his team achieved a record medal haul at the Beijing Olympics. We also discover that Shanaze Reade (pictured left, racing in the team sprint with Victoria Pendleton) has never heard of fixed gear freestyling despite being a world champion cyclist in both BMX and track racing. Someone who is all too familiar with the fixed wheel phenomenon is BikeSnob NYC, who regularly wins gold medals for “systematically and mercilessly disassembling, flushing, greasing, and re-packing the cycling culture”. Over a few ales, the BikeSnob offers his reflections on 2008 and his hopes and fears for the coming year. We talk penny farthings, the Opinionated Cyclist and how to survive the New York winter on two wheels. Play on links below (MP3). Other file formats (e.g. Ogg Vorbis) over here. This entry was posted in Shows, The Bike Show on February 9, 2009 by Jack Thurston. 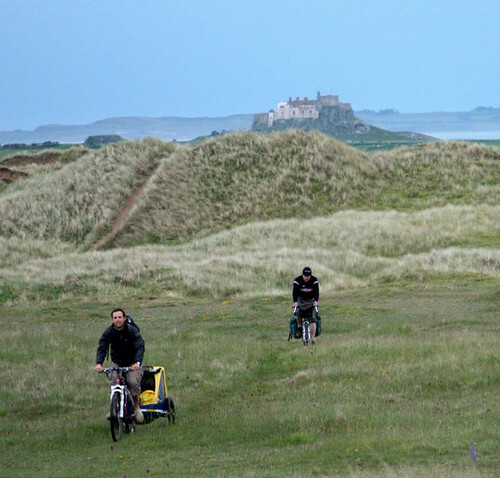 Riding the Northumberland coast from Berwick-upon-Tweed to Newcastle-upon-Tyne with Daniel Start, author of the best-selling Wild Swimming, a guide to natural swimming spots in Britain. Wild Swimming Coast (the salt-water version) will be published in the late spring. To enter the competition to win a signed copy, send an email detailing your favourite wild swimming spot to bikeshow@resonancefm.com. Andrew Stevenson’s account of his Ed Ruscha-inspired 12 Bakeries ride from London to Paris is available to download (PDF). Some excellent photographs of the LFGSS’s Tweed Run available here and here. For more information about the Tweed Cycling Club, there is a website. This entry was posted in The Bike Show on January 28, 2009 by Jack Thurston.